Jaitley also said there is a need to revisit the incentive structure of farming, besides focusing on reducing wastage and improving marketing of farm produce. 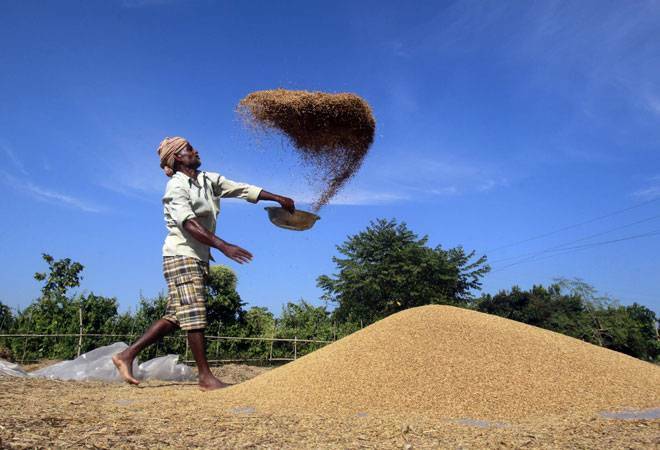 Finance Minister Arun Jaitley has called for focus on higher agriculture productivity through use of the latest technology and high-yielding crop varieties to help double farmers' income by 2022. He also said there is a need to revisit the incentive structure of farming, besides focusing on reducing wastage and improving marketing of farm produce. Mr Jaitley was speaking at his first pre-Budget consultative meeting with representatives of agriculture groups. The finance minister said that "in order to ensure future increases in agriculture output and double the farmers' income by 2022, focus should be on higher agriculture productivity, especially in view of the limitation on expanding crop area". Mr Jaitley emphasised on leveraging technology - especially for high-yielding and resistant variety seeds, efficient utilisation of water for irrigation, adoption of latest IT to increase resilience to nature by phasing sowing, watering and harvesting operations. In order to increase price benefits for farmers, Mr Jaitley said, it is necessary that the farmers are provided timely market information. He pitched for developing software applications, both computer and mobile based, that link farmers to consumers. Along with the use of the latest technology to raise productivity, Mr Jaitley said there is also a need to revisit the incentive structure of farming. He said there should be focus on reducing wastages and enhancing farmers earnings as well as improving marketing of farm produce. "The finance minister said that for efficient implementation of the National Agriculture Market, there is need to integrate the more than 550 regulated mandis in the country by 2017 for which the states need to reform the APMC Act," an official statement said. At the meeting, many suggestions were received from representatives of different agriculture groups. One of the major suggestions was to "provide sufficient funds to District Cooperative Banks where most of the farmers have their bank accounts". The farmer groups also sought higher allocation in the Budget for agriculture and new schemes to bail out farmers from debt. They wanted banks to be directed to implement the scheme of differential rate of interest to the agriculture sector both in letter and spirit and said cargo hubs and dry ports should be encouraged at the production centre of agri products. Other suggestions included announcement of awards for new technological innovations in the agriculture sector and cold chain provision for horticulture and minor vegetables. The meeting was attended by Minister of State for Finance Arjun Ram Meghwal, Finance Secretary Ashok Lavasa, DEA Secretary Shaktikanta Das, Financial Services Secretary Anjuly Chib Duggal, Agriculture Secretary Shobhana K Pattanayak and Animal Husbandry Secretary Devendra Choudhry, among others.